Sherbourne House Small HotelSherbourne House is a privately run country house, built around 1740, which offers an atmosphere of comfort and relaxation for all our guests. Located in the historic market town of Attleborough, Norfolk, Sherbourne House is ideally placed for Norwich, Snetterton Motor Racing Circuit, and places of interest in the Breckland area including Thetford Forest, Old Buckenham airfield, Bressingham and Wymondham. Whether visiting for business or leisure, Sherbourne House offers the perfect location for any occasion. The Restaurant at Sherbourne House offers a place to meet and have a drink with friends or to eat from our menu. Restaurant opening hours are 18:00 to 20:00 from Monday to Thursday, and 18:00 to 20:45 on Friday and Saturday. The restaurant will be closed on Sunday evenings, including for residents. The menu reflects seasonal and local availability and provides a good selection of freshly prepared dishes at a reasonable price. For something different try our German specials. As far as possible our food is sourced locally and prepared. Our meat is supplied by DJ Barnhard Meats, a local farmer and butcher. Our fish travels the short distance from King''s Lynn! Children welcome from any age. Single occupancy is available at £75 per night, please call to book. The price includes a full English breakfast served up until 9.30am, with flexible starting times from 7am. Please note these rooms can be set up as double or twin rooms. Please advise us at time of booking which set up you would like. Roll out beds are available in some rooms at a charge of £10 per night for children under 12 years when sharing with two adults, please call to book. Leave A11 at 'Breckland Lodge' Roundabout signposted Attleborough. Continue for approx 2 miles. On entering Attleborough centre, pass Sainsbury's on your left, continue along the one way system, passing the town green on your left. Reach St Mary's church on your right, take the left turn (signposted Norwich A11). Sherbourne House is approx 200 metres on the right. Leave A11 at exit for Attleborough, approx 500 metres past BP garage. At the end of the slip road, turn left towards the town. 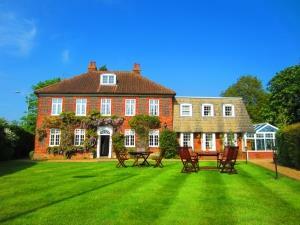 Travel for approx 1 mile, Sherbourne House is on the left, just before reaching the church. Warm welcome and lovely breakfast. We went to Attleborough to attend a Rose Pruning Course at Peter Beales. We extended our stay and enjoyed a lovely few days.